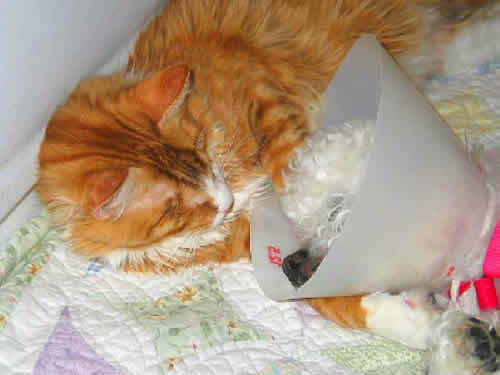 In the photo above, Calypso, recovered from the removal of his eyes, cradles Annie, who is blind, has a history of abuse, and recently had surgery for which she has to wear an e-collar. Here is Annie without her e-collar (but with Emma & Sarah). Here you can see why Annie REALLY doesn't like an e-collar. Here is an update on some members of the family of special needs dogs and cats who live in our home. Please follow this link to the family of special needs cats and dogs who live in our home.